Moroccan Traveller's Phrases PRO EDITION - 400 TERMS AND PHRASES Teach yourself Moroccan Arabic terms and phrases. MOROCCAN TRAVELLER'S TERMS AND PHRASES including TEXT & AUDIO for each term or phrase (TOUCH THE PHRASE TO HEAR THE AUDIO). Easy to use FLASH CARD format - simplified format allows for easy learning Features 21 topics with 400 terms and phrases suitable for travellers or anyone interested in learning basic Moroccan Arabic language. TOPICS covered include: -Short commands -Basic terms -Numbers -Days & times -Navigation terms -Locations -Colours -Sizes -Shapes -Tastes -Qualities -Quantities -Emergency terms -Food & drink -Hygiene terms -Medical terms -Human body terms -Directions & lodging -Occupations -Family & relatives -Weather This tutorial uses romanized text and language and does not include Moroccan Arabic script. 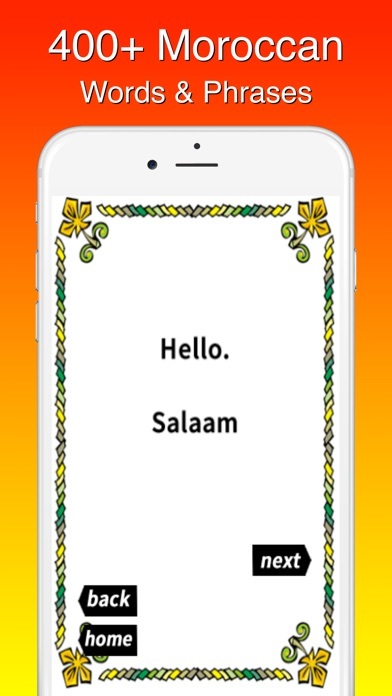 This tutorial focuses on spoken Moroccan Arabic. Instructions ************** Simply touch each term or phrase to hear the term or phrase spoken in English and Moroccan Arabic. The Moroccan Arabic translation is repeated twice (the second time more slowly) to help students understand the pronunciation of each term or phrase. All topics are accessible from the main menu. There are also "next", "back" and "home" buttons to assist users to navigate between terms and phrases. PLEASE NOTE: This app is designed to be viewed in PORTRAIT mode only (do not use landscape mode). Learn Moroccan Arabic terms and phrases with this easy to use tutorial.